I love chocolate mini eggs and I REALLY love the fact that Easter means that they’re usually on special offer, I even love them enough to want to get the pastry out and get baking. 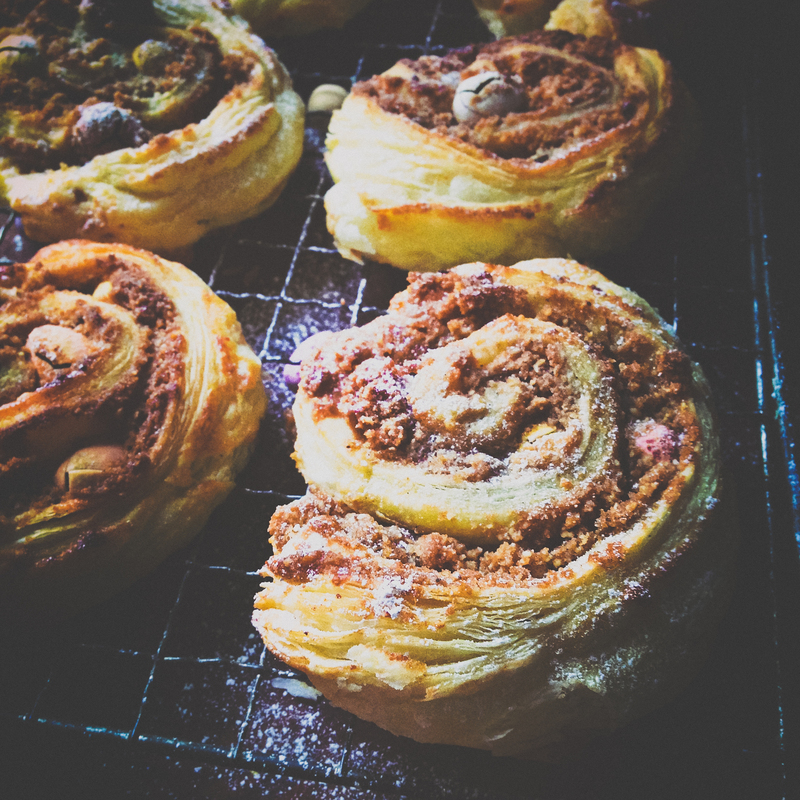 If you haven’t bought the book Bread Revolution by Thoughtful Bread yet or borrowed it from the library then I highly recommend it, thanks to that ace book I made the best cinnamon swirls ever which were my inspiration for these little beauties. 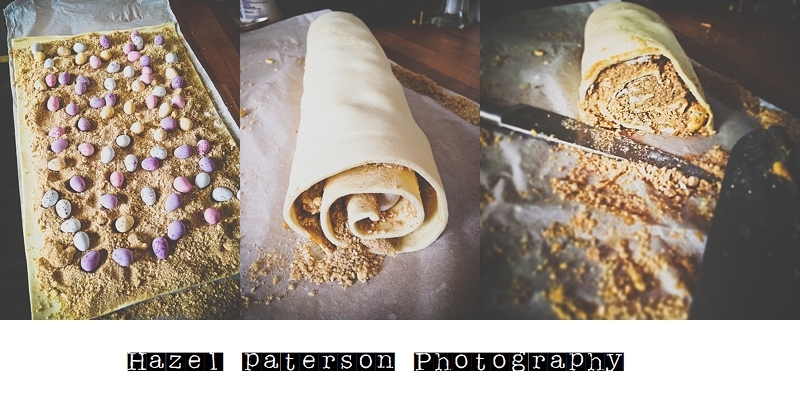 Instead of making a dough I just bought a pack of ready made, ready rolled puff pastry, it cost just £1 and was brilliant, life’s too short for making your own puff pastry I reckon. Ingredients: Makes about 10 swirls. Preheat the oven to 200C. Combine the sugar, flour, butter and ground almonds in a food processor and blitz until completely mixed and powdery. Lay out the puff pastry, brush with some milk then cover with the flour mix then dot with the mini eggs. 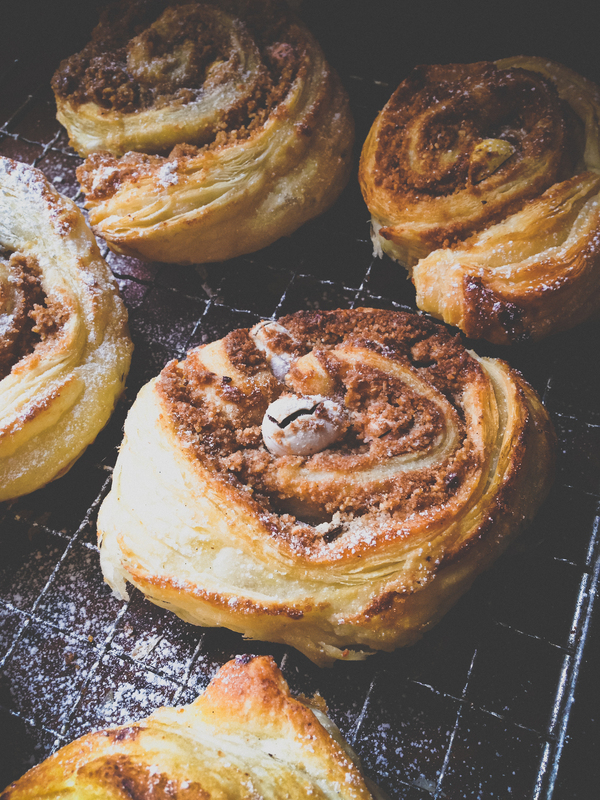 Roll up the pastry very tightly and brush the ends with more milk to help the seams stick, then using a very sharp knife cut a thick slice (about 3cm thick) then use a second knife to help transfer the slice onto a baking paper covered roasting tray. Repeat leaving about 3cms around each round. 5. Bake for 15minutes on the middle shelf then reduce temp to 180C and continue to cook for about 8-10 minutes or until pastry is lightly golden. My oven is really temperamental so just keep an eye on the first batch. Once cooked transfer onto a cooling rack, dust with vanilla icing sugar whilst hot then once again when cold if you have any swirls that made it that long without being snaffled.